The things to do in Merida are almost limitless. The people of Merida have embraced their culture while forging their future. The food, the culture, the art – Merida has refused to stay in the status quo. No matter the time of year or the night of the week you will find something to do in Merida to entertain the entire family. To help you plan your Merida travels, here is a list of our favorite things to do in Merida Mexico. When visiting a new city, one of the first things we like to do is a walking tour of the city. It’s a great way to get acquainted with the streets, landmarks, and history of the area. Plus you may learn about the guide’s favorite place to eat or other hidden gems! The city of Merida has done an amazing job of creating free cultural events, so it’s no wonder they created a free walking tour of Merida. No reservation is needed. To sign up, meet at the Merida Tourism Office 15 minutes prior to the tour’s departure. The office is located at Plaza Grande on the lower level of the Palacio Municipal. On Saturday night, the road in front of the Merida Cathedral is blocked to traffic and transformed into a Mayan ball court. Players adorn traditional dress to play Pok Ta Pok, the Mayan ballgame. They are only allowed to use their hips to score and keep the ball in play. It is one of the most fun things to do in Merida, especially if you are traveling with kids. This version of Pok Ta Pok is full of the traditions of the ancient Maya. Before the game commences the players begin with a ritual of carnal chanting and dance to the bass of drums. The thick smell of woody incense transports you back in time for this ancient game. The players don traditional clothing and put on a rich ceremonial re-enactment of Pok Ta Pok, enduring an hour of intense competition and it is quite entertaining. For best seating plan to arrive 30 minutes before the game begins. Mexican markets are so much fun, and this mercado is my second favorite market that we have shopped at in Mexico. While technically these are two markets, they are so close to each other it feels like one REALLY big mercado. Do not split up if you don’t have two phones. There are so many little alleys and cut-throughs that it only takes a second to get completely turned around. This mercado, like others that are set away from the tourist areas near the coast, are more relaxed and local feeling. There are still a lot of people selling their goods, but it’s not the high pressure ‘come-buy’ that you get along the beaches. It’s much more relaxing strolling down the aisles without being bombarded by a sales pitch. You will actually be able to browse and touch the items in this market because they have yet to be taught by their coastal counterparts that sales are produced by being the louder and pushier salesperson. Paseo de Montejo is the most iconic street in Merida. Modeled after Paris’ Champs de Elysees, its buildings are evidence of the wealth created by henequen industry in the 19th century. Every Sunday the street is closed to traffic and Merida residents enjoy a leisurely walk or bike ride along the picturesque Avenida. Admire the beautiful mansions as you stroll this wide Avenida, or rent a bicycle to experience the Bici-Ruta. There are so many things to do in Merida and visiting a museum (or two) should make your list. The museums in Merida range from archeological to contemporary Mexican artists. Many of the museums in Merida are free, helping add to your ever-growing list of free things to do in Merida. Check out our guide to the 7 Museums in Merida Mexico. The Merida Cathedral is again the backdrop for this fun event. A vivid light show is projected onto the cathedral, depicting the history and culture of the region. Video mapping has become very popular in this area of the Yucatan, with similar light shows in Valladolid and Chichen Itza. Go for the music and the dancing! The Yucatan Serenade has been a tradition in Merida for over 40 years and Parque Santa Lucia is the perfect setting. If you require a seat, arrive early. There are bleachers in front of the stage but they fill up quickly. The park is also surrounded by nice, somewhat expensive restaurants. If your timing is right, you could snag an outdoor table and enjoy a cocktail while watching the performance. The Yucatan Serenade is part of a series of weekly events called Corazón de Mérida (Heart of Merida). I recommend looking at this calendar of events for the weekly recurring events and any Merida festivals during your visit. There seems to be a free event scheduled every night in Merida as well as many festivals throughout the year. Like these things to do in Merida? Pin it to save for later! For some, the cemetery may seem like an unusual addition to our list of things to do in Merida. For others, it may offer a place for reflection. We visited the General Cemetery in Merida twice during our month-long stay. The first time was for the weekly Cemetery Night Tour, which was all in Spanish. Our second cemetery visit was also at night for the Paseo de Animales, Merida’s Day of the Dead parade. Established in the early 19th-century, the General Cemetery was the only Merida cemetery for many years and is quite large. The mausoleums remind me of the cemeteries in New Orleans. However, if you look a little closer you’ll notice how customized each one is. The ornate mausoleums replicate the houses of the deceased to make the transition from life to death easier. During our trip to Merida, we stayed at an Airbnb in the García Ginerés neighborhood, located Northwest of Centro Merida. After reading about the nearby Slow Food Farmers’ Market on Saturdays, we decided to check it out. We usually avoid the major streets, but somehow ended up on Avenida Colon, a two-lane one-way thoroughfare in Merida. I was so glad we did! There are several beautiful homes along Avenida Colon between Calles 12 and 6. Many of which are in the perfect state of disrepair. A warning: Many visitors have been known to fall in love, restore one of these mini-mansions in Merida and never leave! This restaurant at the Slow Food Farmers’ Market makes our list of Things To Do In Merida. Go for Saturday breakfast and shop the market after. JT’s Menudo soup and Julien’s favorite, chorizo sopes. One of our favorite things to do in Merida is to spend an afternoon sipping on cold cervezas in a Mexican cantina. A traditional Mexican cantina is a small, no-frills bar that serves FREE botanas (or snacks) with each round of drinks. Typical cantina food consists of cucumber, jicama, orange with tajin, stewed pork, ceviche, beets, and squash but it can be anything the kitchen cooks up that day. We’ve created a self-guided Mexican Cantina Tour of Merida or if you’re up for meeting new friends, you can join this group when they organize a cantina afternoon. Our Cantina Tour of Merida includes two options. If you get started early enough you can combine the two cantina tours for a full day of debauchery. One of my favorite things to do in Merida is to shop for antiques, even if we’re only window shopping. Merida and the surrounding Yucatan Peninsula is dotted with haciendas that emerged during the 19th-century henequen boom. After the henequen industry collapsed in the mid-20th century, many of the haciendas were abandoned and went into disrepair. However, many of the haciendas in the Yucatan have recently been restored as hotels and restaurants. And as the demand for architectural antiques in the area increases, so has the supply. 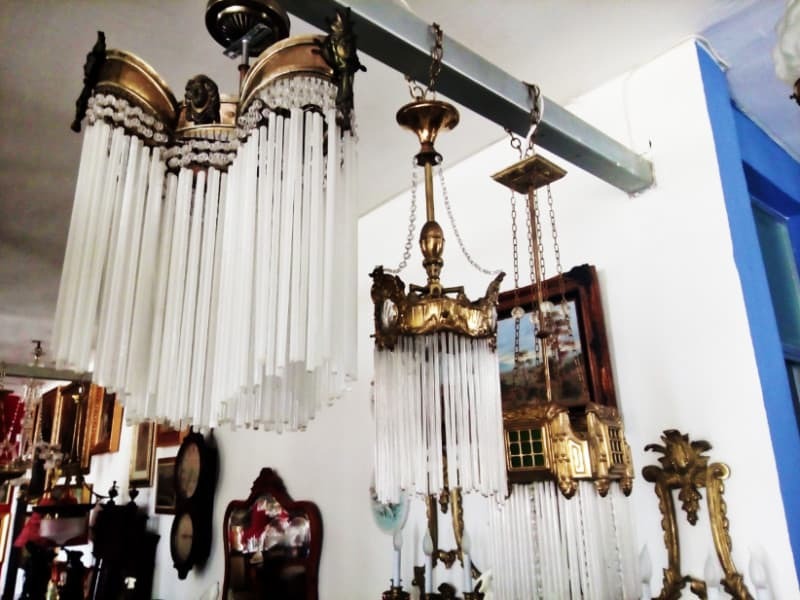 There are several places to shop for antiques in Centro Merida, but if you have a car I recommend visiting some of the antique shops outside of downtown Merida. Finding some of these Merida antique stores can be a fun hunt on its own! Read our guide to antique stores in Merida to discover your own Yucatan treasures. A guayabera (pronounced ‘why-ah-bear-ah’) is a traditional men’s shirt worn in Mexico, and Merida is the place to buy a guayabera in the Yucatan. Merida is the major manufacturer of this stylish garment, having added their own flair to this already versatile shirt. Shopping for a guayabera in Merida, you will find yourself having so much fun bouncing from specialty shops, to boutiques, to manufacturers. There is a color and style to match everyone’s needs for any occasion. Shop around and you will find the perfect guayabera for you. A nice lunch or romantic dinner at a hacienda could technically be a day trip from Merida, or you can just as easily make it a few hours outing. Many of the haciendas near Merida have been restored into boutique hotels but you don’t have to be a guest at the hotel to enjoy the hacienda grounds or its culinary delights. Still, it’s best to call ahead for a reservation to confirm the dining room isn’t closed for a private event. Most haciendas have an English version of their website. The Yucatan Polo Club is a friendly group that gathers on Saturday evenings and Sunday mornings to scrimmage one another. We had never been to a polo match, so it was new and a lot of fun. This is a family-friendly event that offers a small cash bar, or you can BYOB. It is a little out of the way, so a vehicle is needed to attend. While going to the library may not initially make your list of things to do in Merida, most intriguing are the lectures, wine tastings, and other events held from October-March when the snowbirds are in Merida. And keep an eye out for the occasional Merida house and garden tour in late winter by visiting the Merida English Library website. Merida is a cosmopolitan city of traditional meets new. And while there are plenty of things to do in Merida, it also makes for a great base to explore the Yucatan Peninsula. As Merida becomes a bigger travel destination, more and more affordable direct flights are being added. If you don’t find any from your departure city, check out flights to Cancun. From the Cancun airport, Merida is a 3-4 hour bus ride with ADO. And check out C Boarding Group for awesome Airport Travel Tips. There are 7 super simple tips you should use to ensure the best travel experience. Enjoy our travel guide for things to do in Merida? Pin it for later! Mexico is one of my dream destinations! I love the culture, the language and the people so much! Completely agree. The people are so kind!